Someone mentioned the word “games” at a party I was at, and my radar picked up on it. Unfortunately, I was really annoyed by the conversation that followed. Obviously this person decided I wasn’t cool enough to know about some new game, not knowing anything about me or my interests. And the idea that somehow I would lose interest in the conversation if it was a board game versus a computer game? How ridiculous! I love games, no matter what medium I play them in. I almost wanted to continue pestering this person just to annoy them, but I decided to take the hint and stop trying. There are people today who think that games grew up with them, that “The Past” consisted of Sony Playstation and the CDROM versions of The Oregon Trail. I fall into this trap as well. My childhood was spent playing games on the Apple II c+, Atari 2600 and NES. When I say, “Remember when…”, I know I make some people feel old when they think about their childhoods being defined by games played on the PDP-1, at the arcade during the golden age, or hosting a BBS. But even before, there were games. Games have been around for almost as long as humanity has existed. That people decided to make games on computers as soon as the computers were capable shouldn’t have been a surprise. But no one should pretend that video games or computer games are all there is or that they are somehow superior to board and card games. My childhood was also spent playing card games and board games. Scrabble and Battleship and Monopoly were played regularly. Some games held my interest more than others, but video games always seemed more diverse and fascinating. 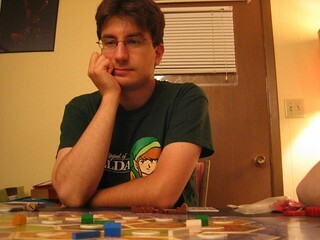 When I was introduced to some very cool games in the last 10 years, I learned that it wasn’t just Uno and Monopoly, that there is a lot of entertainment to get in traditional, non-computer games. Settlers of Catan is typically seen as a gateway to Euro-style board games, and I was fortunate to have met people who could introduce me to it and to some of the other games in their collection. I got a late start, but I’ve been really interested in playing card games and board games beyond the standards that Hasbro keeps publishing. I enjoy perusing the massive collection of games at my local comics and gaming shop, talking with the workers there and getting their recommendations. My most recent purchase was Mage Knight after someone tweeted about the game designer Vlaada Chvatil. After talking with someone at the shop, I got a few recommendations for some of Chvatil’s games, and walked away with this super complex game that also lets you play by yourself if you can’t find anyone willing to play it with you. So, The Other Person, you can keep your snobby, secret conversation about a game I supposedly wouldn’t have heard about. There are plenty of games to go around, and I’m sure I won’t miss it.